How do the two consumer products titans stack up against each other as investment prospects? Due to stubbornly weak sales and pricing trends, Procter & Gamble (NYSE:PG) and Kimberly Clark (NYSE:KMB) stocks have missed out on the market's latest multiyear rally. Yet these consumer products titans have a few attractive characteristics (including that relative discount) that might make them good buys for some investors. Below, we'll match the stocks against each other to see which one has the best chance to generate healthy long-term returns from here. Sales growth excludes acquisitions and divestments and is on a constant currency basis for the past complete fiscal year. Data sources: Company financial filings. Since they compete in many of the same industries, it might be tempting to lump P&G and Kimberly-Clark together in the category of "struggling consumer products giants." But while that general description fits, there are significant differences between the two businesses. Thanks to its generally stronger brand portfolio and lower cost infrastructure, P&G enjoys faster growth and better profitability. Organic sales rose 1% over the last year while Kimberly-Clark's comparable figure has been flat. 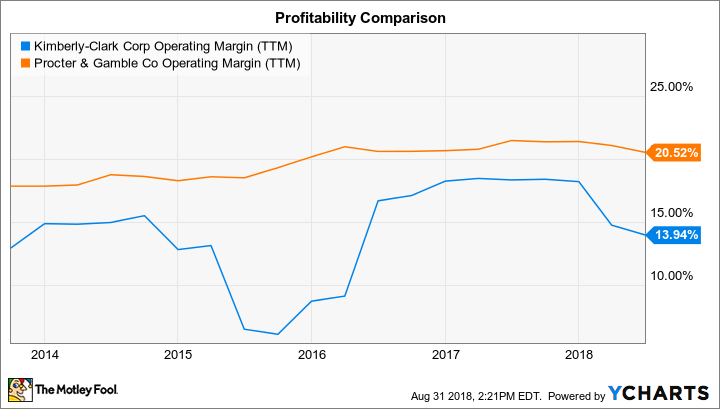 P&G's operating margin -- over 20% in the trailing 12 months -- routinely outperforms that of its smaller rival, too. KMB Operating Margin (TTM) data by YCharts. Those broader dynamics should color the next few quarterly results from these companies. P&G is expecting sales to speed up to between 2% and 3% in its new fiscal year, while Kimberly Clark is targeting just a 1% uptick. P&G is also further along in its transformation strategy, having completed its brand-shedding initiative over a year ago. Kimberly-Clark is targeting many of the same types of changes that P&G made in that period, including a revamp of its supply chain and the divestment of underperforming franchises. The consumer products giant is planning to dramatically cut costs, too, with hopes of pushing its profitability up toward P&G's 20% mark. The maker of Kleenex tissues and Huggies diapers only recently began that shift, though, and so it might take several more quarters before shareholders have a clear picture of how effective the moves will be at speeding sales growth back up. It's possible that Kimberly Clark's rebound plan will spark significantly faster organic sales while supercharging profits. Optimism on that point might help explain why its stock is valued about the same as Procter & Gamble's despite its weaker operating results. Yet P&G looks like the safer bet at today's prices. Its collection of global hit franchises is a valuable asset, and so is its world-class marketing and selling infrastructure. What's more, shareholders don't have to wait for results from a dramatic restructuring plan to see evidence of improving demand trends. P&G is already predicting faster sales, rising prices, and sharply falling expenses. Those positive trends don't mean that P&G will end the modest, but persistent, market-share slide that's kept the stock trailing the market over the past three years. But they do imply that the industry leader is better equipped than Kimberly-Clark to deliver higher returns, and rising dividends, to shareholders over the long term.